A Winter Paralympic Games champion tried his hand at Para Laser Run for the first time during the 2018 UIPM Global Laser Run City Tour event in Auch (FRA). It was the third of four GLRCTs taking place in France in 2018 and a number of wheelchair athletes were among the 180 participants. Omar Bouyoucef, a four-time Winter Paralympian who won gold in biathlon in Lillehammer (NOR) in 1994, was one of them. A spokesperson for the local organising committee said: “Omar enjoyed his Para Laser Run initiation and said afterwards that he loved the sport and hoped to participate in another event soon. 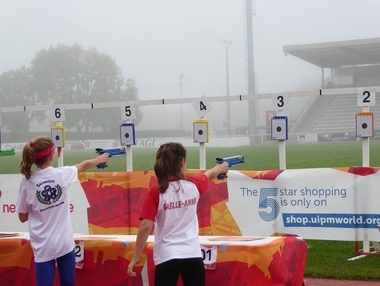 “This successful Global Laser Run City Tour came on the back of an excellent event in Montpellier, which attracted 264 athletes and where we hope to establish a new club soon.